St. Ann & the Holy Trinity Church will present I Am the Vine, You Are the Branches, an installation of sculpture and mixed media by artist Nancy Azara. It opens on Ash Wednesday, February 18, at noon. The exhibition is an offering of the visual art program of St. Ann’s, a part of The Forum @ St. Ann’s, which seeks to engage the community in conversation about the arts, ideas and civic life. I Am the Vine, You Are the Branches, installed for the church season of Lent, comprises sculptures, banners and collages using a variety of materials, including branches, vines, carved wood, and mylar. According to Azara, she is motivated by the need to “touch a longing within us for a route to the divine.” Her use of wood suggests not only a spiritual connection to the tree as divine symbol, but also the fragility of such a relationship in the face of destructive forces. The works in this exhibition can provide opportunities for contemplative engagement for those who wish. Azara lives and works in New York City and Woodstock, NY. Her work is featured in numerous solo and group exhibitions throughout Europe, Asia, and America, and was most recently at Gallery Sensei, Pseudo Empire, and the Asya Geisberg Galleries in New York. In 2013, she exhibited at SACI Gallery, Florence, Italy, and earlier was an artist in residence at Civitella Ranieri, Umbertide, Italy. She was a founding member of the New York Feminist Art Institute (NYFAI) in 1979 (to 1990), and author of “Spirit Taking Form: Making a Spiritual Practice of Making Art” (published by Red Wheel/Weiser in 2002). 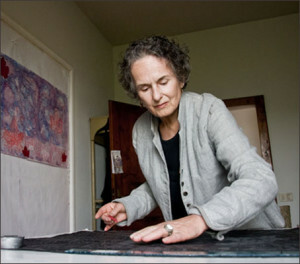 Her works may be viewed at www.nancyazara.com and the artist herself in her recent video: http://youtu.be/-l9lCGcRkVI. The exhibition will be on view at St. Ann & the Holy Trinity Church Tuesday through Thursday, 12 noon – 3:00 pm, Sundays 9:00 am – 1:00 pm, and by appointment by contacting the parish office at 718-875-6960 or office@stannholytrinity.org. 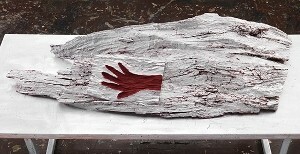 Image: “Reclining Hand,” sculpture by Nancy Azara. Wood fragment painted with aluminum paint.